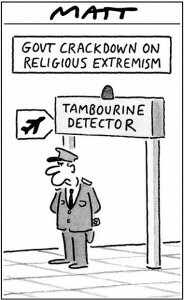 The Telegraph has a slide-show series of Airport Security cartoons. It is looking likely that at the next general election, whenever it is called but certainly before next June, that the current government will be deposed and Her Majesty’s Loyal Opposition will take over. It is therefore with dismay that I heard this offensive speech from a member who is likely to become a minister under that administration. I refer to a passage in which Michael Grove, Shadow Secretary of State for Children, Schools and Families, managed in one short paragraph (last paragraph) to offend a member of the public not associated with the debate and also to indulge in a form of humour which may be mildly amusing in a playground. Perhaps that is why his brief is for schools. Of course we knew what to expect when here he made a “joke” on the Secretary of State’s name—the lowest form of wit by any standards. Politicians of the world seem to have trouble understanding the concept of mercy. Mercy is unconditional. It does not require any response from the recipient, either in action or restraint. The recipient doesn’t even have to be grateful or understand why. Mercy is independent of whatever the recipient may have been accused or convicted of. Mercy is not dependent on actual guilt or innocence, just that the recipient should be receiving a sentence that can be reprieved. Mercy supersedes all other considerations and is a gift in the sole power of the giver. It can be given or withheld, it is not a right. Mercy is a mark of civilisation. It shows that we are above revenge and retribution. Scottish law provides for mercy in the power of the secretary of state on behalf of the government. Kenny MacAskill exercised his authority and explained in great detail that this was what he was doing. Read Zechariah 7:9 and Matthew 5:7. Posted in Politics, Security | Comments Off on ID Card Victory? A piece of news that has made no impact at all in the uk. The Piratpartiet (Pirate Party) has gained one seat in the European Parliament. They polled 7.1% of the vote in Sweden on a manifesto of Copyright Freedom and protest of the conviction of the Pirate Bay organisers earlier in the year. Their platform is not “make everything free” but more a call to consider the rights and needs of all the people, particularly in regard to Intellectual Property such as Copyright & Patents. When it is mostly the young that are caught up in this, no more is “I’d like to help you son, but you’re too young to vote” acceptable. Judge: The jury have returned their verdict and you have been found not guilty of all charges. I therefore sentence you to twelve years of suspicion; twelve years of wondering if there might be a knock on the door if you happen to have been near a place where a crime was committed; twelve years of being an automatic suspect for every new crime investigated. This is what the ruling to retain DNA samples of people not charged or later acquitted of crimes means. The Home Secretary said “We will ensure that the most serious offenders are added to the database no matter when or where they were convicted” but these people were NOT convicted; in many cases they were not even charged. There is talk of them extending the 6/12 year limit to fingerprints as well, but we know that is a joke—everyone’s fingerprints will be on the National Identity Database anyway. I came across this little cartoon which explains what the crisis is all about (there is a part 2 as well). Now the naive bit—the toxic assets, the sub-prime mortgages are people’s homes. They need somewhere to live. So if they default due to lack of employment or whatever then the houses now belong to the government (having bailed out the banks). The government announced a short while ago that there was a shortage of rental property—well there they are then! For Christmas we received one of those tear-off daily calendars and this particular one is called Forgotten English about obscure ancient words. Below each definition is a short (vaguely) related article. With the discussions in the news about the responsibility of the heads of the banks, the one for last weekend was very appropriate. One is brought up with the assumption that those in charge are reasonably intelligent and to achieve government office you would need to be very bright indeed. I am sure that some of them are very smart, though don’t ask me to name one just at the moment. So how did someone like the Rt. Hon Andy Burnham MP become Culture Secretary? I refer you to this interview in the Daily Telegraph late last year. Now, I don’t expect him to know everything, not even in his own portfolio, but the mark of intelligence is knowing when you don’t know and finding out by asking someone who does. He clearly knows nothing about the internet; in fact, it looks doubtful if he has ever used it. So, just to help him out, here are some facts. The government doesn’t control the internet. No government does, how ever much they would like to; it is amorphous. The ISPs don’t control it either, they just provide the end user connectivity. Even restricting it to English language sites doesn’t narrow the problem. There is no reliable way to prove your age, especially online. Not even that you are an adult. The computer or whatever is being used belongs to the user, not the ISP. The way they work also belongs to the user; it is a bit late to back track on that and try to implement some sort of DMCA controls on them now. There are too many web sites out there to be content rated manually and any automatic method is unreliable, hence trying to control access to it that way doesn’t work. Any attempt to do so will certainly miss some very bad places, stop access to some very good ones and give people a sense of complacency. ISPs did try offering Child Safe services but they were not popular because parents found them limiting for all but the very youngest of children. “It worries me – like anybody with children,” he says. “Leaving your child for two hours completely unregulated on the internet is not something you can do. Right! It is not something you should do either. Learn to spend some time with your children. To further support my argument, note that Andy Burnham previously worked for David Blunkett and Ruth Kelly when they were drafting the ID card ideas.